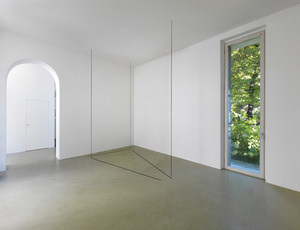 The American artist Fred Sandback (1943–2003) worked with elastic cord and acrylic yarn to delineate or bifurcate three-dimensional space, creating room-filling volumetric forms using the most minimal of means. By stretching single strands of yarn point-to-point to create geometric figures, Sandback’s near intangible objects nevertheless amounted to precise and subtle delineations of pictorial planes and architectural volumes. 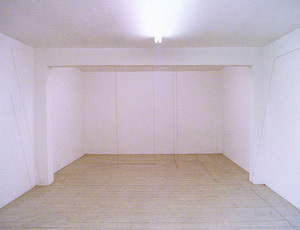 Despite this relationship to the built environment and to the practice of drawing, he became known primarily as a Minimalist sculptor, alongside such contemporaries as Dan Flavin, Donald Judd, Sol LeWitt and Carl Andre, but Sandback was also a forerunner of and a major influence on many of today’s installation artists. Contrary to his own matter-of-fact artistic statements about his practice, his work has been said to conjure up references to architecture, painting, sculpture and even music, given his early fascination for stringed musical instruments.